« Day 4 – Poblacion de Campos and Good Weather! An interesting pattern is starting to emerge. This is our 5th of walking since leaving Burgos on May 17. We meet fellow pilgrims along the way. For most, it is a simple, “buen camino” initiated by one and followed with a “buen camino” from the other. Fellow pilgrims walking the camino that we will likely never see again. For others, a simple conversation may last but a few minutes while others may go on for hours. If they’re traveling at the same relative pace as you are, an encounter down the road is likely. Then there are those fellow pilgrims in which days together are shared. Real bonding can take place with those pilgrims. With only 5 days on the road a few fellow travelers are emerging into that latter category. We left Burgos last Friday. 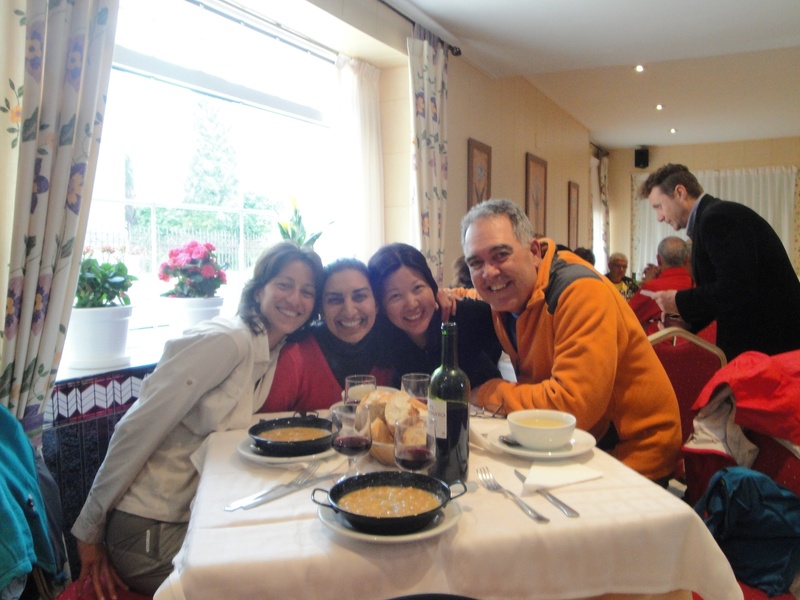 Our first stay was at Rabe de los Calzados. I nice easy start to develop a feel for the Camino. The second day we walked to Hontanas which was a little further. By chance, there was a German lady who was assigned a bed right next to ours. She was in the same Alberque, but in a different room, as us the first night. Now she was right next to us. Nancy, Andrea and I all enjoyed her company. The third night we stayed at a very nice Alberque in Itero de la Vega. As we approached the courtyard of that alberque there she was! We were starting to think that this was no coincidence! We started having more in depth conversations with her and we have become quite friendly with Heike Ortmanns from Aachen, Germany. I will post a picture of Heike very soon. 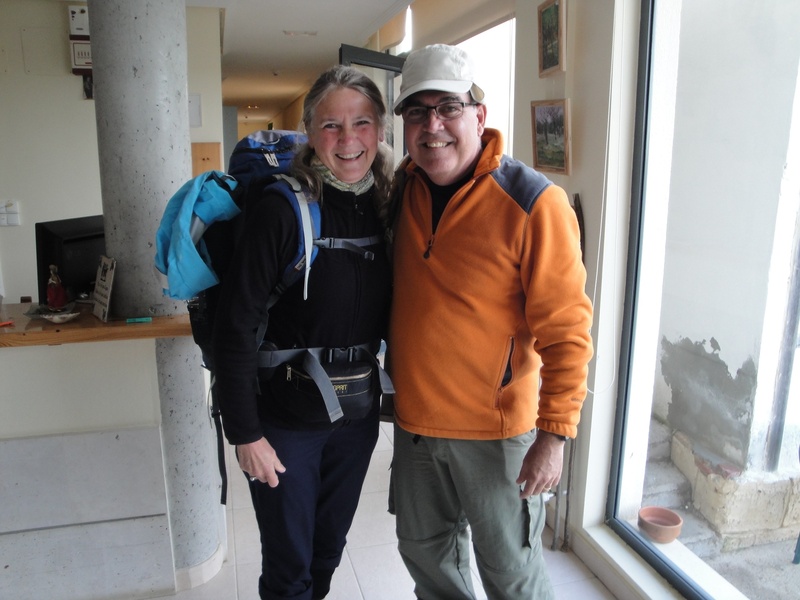 She is a very kind and friendly lady braving the Camino on her own. 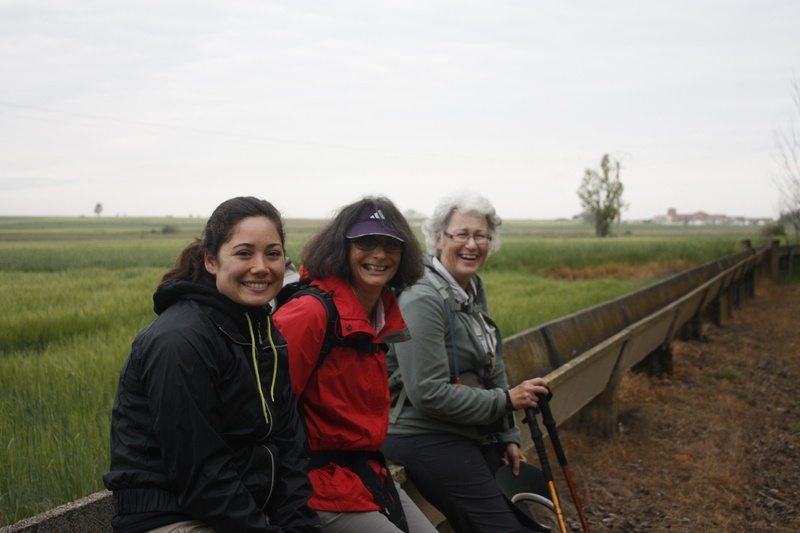 She started her Camino from Burgos like we did and on the same day! To date, we’ve been keeping the same pace and using the same strategy of not taking it too hard and trying to develop our hiking legs. It should be no surprise that we’re staying in the same Hostel Santiago in Carrion de los Condes this evening and that tomorrow we will be attempting our longest hike so far, a 27 kilometer walk to Terradillos de los Templarios. We’ll know tomorrow afternoon if we’ll be able to keep up that type of pace. According to the standard guidebooks that defines each recommended “stage” for each day of walking, we’ve taken 5 days to walk the first four “stages” which I believe is not bad given Nancy’s knee, Andrea’s hips and now a knee, and my lower back and ankles. So far, not a single blister has emerged. I credit that to quality long distance hiking boots (an essential piece of gear), quality liners and smart wool socks. 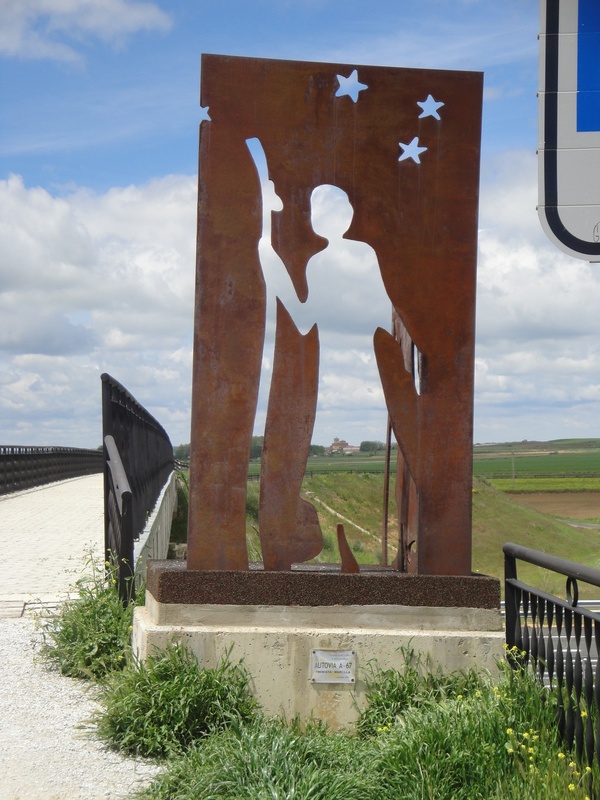 Tomorrow will be a real challenge for us in that we will be hiking into an even more rural area than the ones we’ve hiked so far – and that’s saying something when walking across the Spanish Meseta. We will hike over 17 kilometers with no places to stop for food our water. There are a few “fuentes” (water fountains) along the way with potable water but none of us have taken that chance yet. We’ve been bringing bottled water (poured into our water bladders in our backpacks) or using the potable water from the alberques and hostels we’ve been staying at. So far, that seems to be working out. We went to a local store this evening to buy food to sustain us tomorrow since we won’t pass any place serving food until about 1400 in the afternoon. I also stopped at a local pharmacy because I’m catching a cold. Sore, scratchy throat, one ear sensitive to the touch, coughing and runny nose. I’m loading up on orange juice and the pills the pharmacist gave me. We’ll be hiking by 0800 tomorrow morning and plan to cover our 27 kilometers by 1500 in the afternoon. It will be our most challenging day. We have also made good Camino friends from Australia. The are a lot of fun to walk with, we’ve stayed at some of the same towns (not always the same Alberques as with Heike) and now unfortunately will be departing with them tomorrow. Nick and Judy (married many years like Nancy and I) from Queensland and Judy’s dear friend from their university days, Debbie. They are really decent folks with fun-loving senses of humor. I might share later on my embarrassing moment when I unexpectedly barged into their room! Judy and Deb are taking the bus to Leon tomorrow while Nick is riding his repaired bike to Leon. That puts them at least 4 days ahead of us. We’ll likely not see them again on this journey. Buen Camino, mates! The Camino gives back in so many ways. Yesterday, we walked with two young, lovely ladies, one from the UK of Indian descent and the other from Japan. 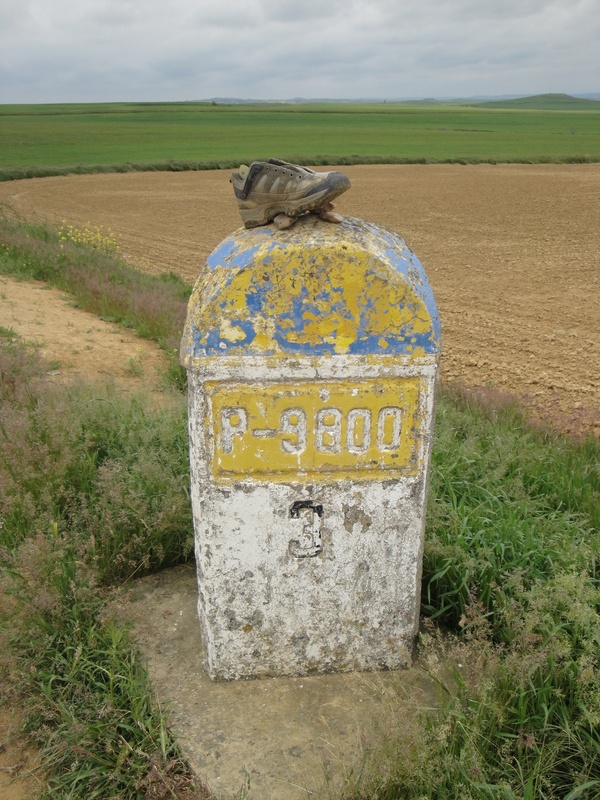 They met on the Camino and are now walking together. They seem to be fast friends now. Anyway, I had a very pleasant conversation with them and basically gave them a “father to daughter” type conversation. They are the ladies we took with the old Spanish gentleman as we entered Boadillo de Campos yesterday afternoon. Well, what is becoming a pattern with Camino friendships, as we were leaving the restaurant we ate at this evening, we say them at a table with a young Italian lady and young Spanish gentleman. We were very happy to see each other. They are both very kind and lovely pilgrims. We hope to see them again along the way! I will have to close for now. It’s nearly 2130 in the evening and I still have a few pictures to post. Nancy is holding up very well. She’s a true champion. Her knee seems to be holding up and she seems to be getting stronger. Andrea is also getting stronger and has youth on her side. My feet, ankles and lower back felt a little better today but am now fighting a cold. We are in remarkably good shape so far given the limping and pained faces we see along the way. One lady may lose 4 of her toe nails. Many people don’t complete their intended goals. Some take the bus to shorten their walk. Like life, each of us must find our own way to deal with our daily struggles. 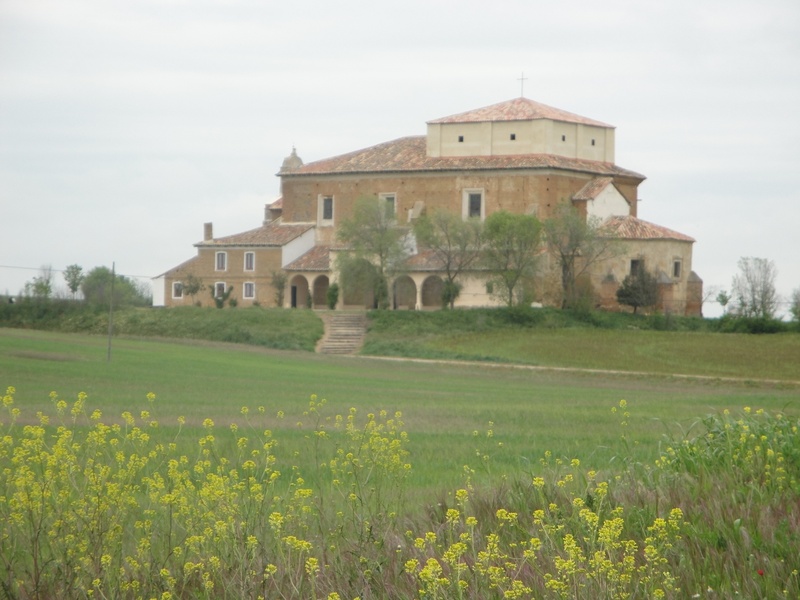 This afternoon in the 12th century village of Villalcazar de Sirga, I walked into their marvelous 13th century Knights of the Templar church of Santa Maria la Virgen Blanca and knelt to pray and to give thanks for this opportunity to experience the Camino and to ask for protection of all the pilgrims on the Camino. 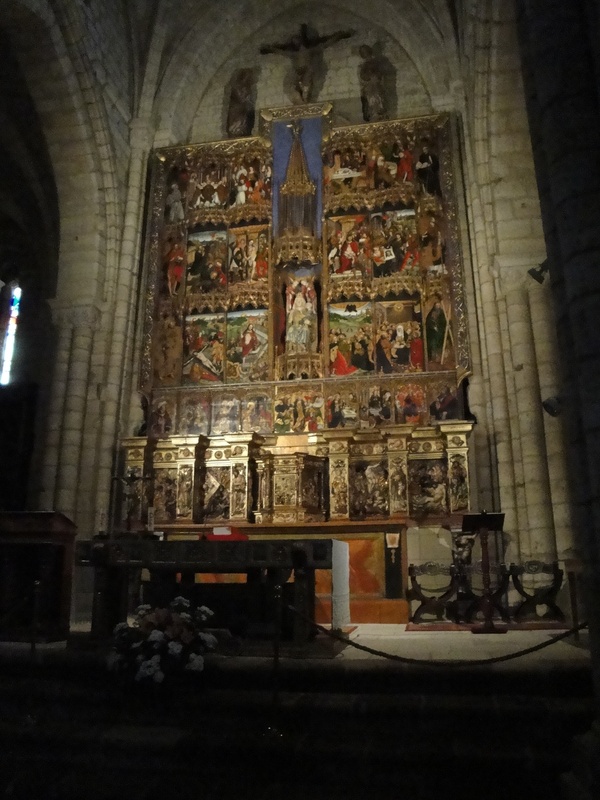 The altar has a panel that shows the life of St. James. Very moving. I hope to make another post tomorrow evening. 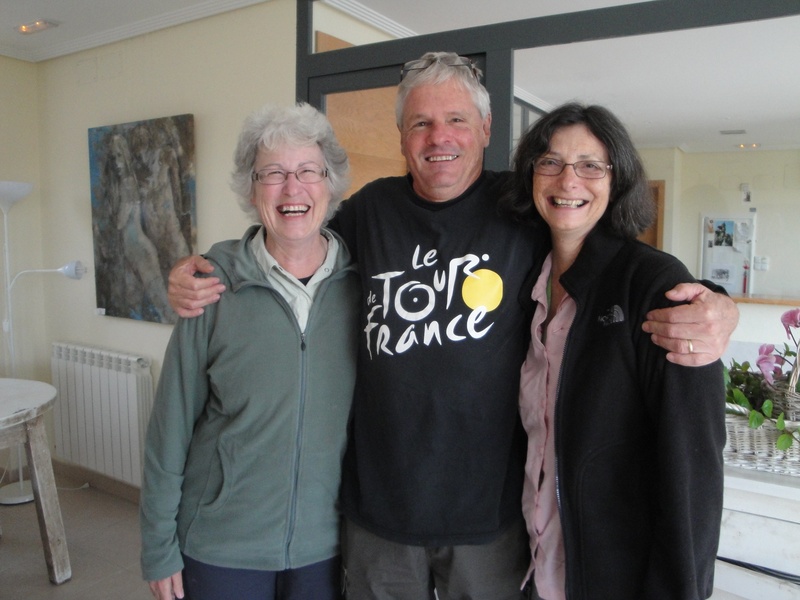 Great Camino friends from Australia, Debbie, Nick, and Judy. They’re off to Leon tomorrow! Another friend we’ve met along the way, Cecelia from Denmark, traveling on her own. I’m sure the owner of this hiking boot has one heck of a story to share! Nancy and Andrea cuddling and trying to get warm after a long day’s walk. Andrea with Debbie and Judy of Australia. I always have this blog open on my browser waiting to see where your journies are taking you and you write so well it almost feels like I could be right there with you all. Getting your hiking legs seems to be coming sooner than you expected, and I hope for you that in the end you can surprise yourself with how far you’ve come! Now you just have to figh that darn cold, it’s going around here in the states it’s funny how that’s happening overseas as well. As always take care, and while I’m not sure if Andrea is reading your posts or the comments I’ve already made but tell her for me that I love and miss her dearly and I’m so proud to see her doing something I would’ve never guessed to see her do in a hundred years. Much love an safe prayers to you all.